Jack White hates modern technology, with all its distracting blips and beeps and Candy Crush and Snapchat filters. This much we know. So the fact that, upon entrance to the venue tonight, we're instructed to pop our phones into specially-sealed bags that physically can't be opened without the aid of the fancy contraptions stationed at the venue's exit - even if you get a really good text - isn't really a surprise. But while this kind of exercise could be a curmudgeonly annoyance at lesser shows, tonight the Detroit star goes about justifying his demands with a gig that's brilliantly, viscerally deserving of every inch of your attention. 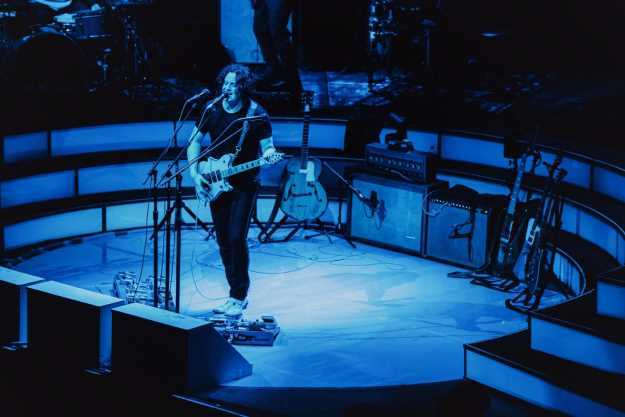 Though a series of video screens augment the audio with various scenes of blossoming flowers, swirling shapes and, before the singer arrives, a slowly ticking countdown, inferring that his former 'no setlists' policy has probably been loosened these days, there's always been a reckless energy to Jack White's live shows. Throwing in snatches of covers, elongating or altering the oldies and essentially keeping the crowd on their toes from beginning to end, they're sets that implore you to live in the moment right there with him - and tonight, with nary a iPad in sight, the crowd hang on his every move. Bathed in the eerie blue that's become the trademark of his solo aesthetic, and flanked by three of everything (three screens; three microphones), you don't even need to see the man at the centre to know who the stage belongs to. But from the moment White enters to the fizzing whizz of 'Over and Over and Over', darting onto the platforms either side of the stage to wrangle unholy solos from his guitar, there's still few who can match him. Though technically on the tour for recent LP 'Boarding House Reach', tonight's set doesn't dwell too heavily on the newies, instead serving up a joyous romp through his considerable back catalogue - from The White Stripes, through The Raconteurs, via The Dead Weather and out to his recent solo forays. Incredibly, considering there's nigh-on two decades separating some of the material, it all flows seamlessly. The spat-out lyrics of 'Lazaretto' roll into the meaty opening notes of 'Dead Leaves and the Dirty Ground' like natural pals, while a huge sing-along of a stripped-back 'We're Going To Be Friends' and a jubilant 'My Doorbell' make strangely comfortable bedfellows with the heart-on-sleeve emotions of 'Love Interruption'. Aside from the occasional holler to make sure the crowd are still fully with him (no worries there), Jack's not a huge one for stage chat, but he doesn't need it. Gleefully throwing in a snippet of 'Heartbreak Hotel' into an already fully hoe-down version of 'Hotel Yorba', and howling his way through 'Corporation' like a wild-eyed lunatic, Jack's personality is drenched all over every note. When you can have an entire venue hanging on every note of instrumental 'High Ball Stepper', why bother with unnecessary words? Returning for an encore, he breaks straight into a brilliantly, seethingly spiteful 'Icky Thump' and the wonky 'Fresh Prince of Bel-Air'-esque rap of 'Ice Station Zebra' before rounding things off with a raucous 'Steady As She Goes' and - of course - one final burst of 'Seven Nation Army'. For a man who's spent the last two decades crafting one of the most prolific and prestigious careers in modern music, you'd forgive Jack White for shying away from these kind of obvious, populist indulgences. But as he merrily revs the crowd up, encouraging them to sing the guitar riff that's found its way onto football terraces across the world, there's no pretence here. It's the same logic that justifies locking your phone away as the one that allows him to happily hammer out the bangers; all he really wants is for people to have the best 90-minutes possible. Mission accomplished.